Soils are where it all begins. A silent ally for food production, soils are where 95% of food is produced globally. Therefore the preservation of healthy soils is essential for future food production. The healthier the soil is, the better the crop will be. Healthy soils can sequester more carbon, store and supply more clean water, maintain biodiversity, and improve resilience to droughts and floods. Soils are incredibly resilient, but they are also fragile and can be easily damaged or lost. Soil pollution has been harming food security, human health (through contamination of food crops) and the environment. It also has economic impacts due to reduced crop yields and production. Most of the pollutants originate from human activity such as unsustainable agricultural practices, industrial activities and mining, and other non-environmental friendly practices. Since soil is a finite resource, its loss and degradation is not recoverable within a human lifespan. In Sri Lanka, effort is being made by the Government, farmers and the youth to be the collective solution to soil pollution. The Food and Agriculture Organization of the United Nations (FAO) is facilitating this active involvement of all stakeholders to adopt environmentally friendly agricultural practices in some of the most degraded agricultural lands in the country. “I felt that if more fertiliser is applied to the paddy field, I could obtain a higher yield. For instance if the colour of the crop is not dark green, I would apply more fertiliser than what is recommended until I see a change in colour. But this caused damage to the crop which was plagued by pests and disease,” laments B.M. Jayaratne, a farmer from Kumbukgate in the Kurunegala district. Like Jayartane, a vast majority of farmers apply fertiliser and agrochemicals indiscriminately to their crops, increasing environmental pollution such as soil pollution, and contamination of surface and groundwater sources which impact human health. The excessive use of fertiliser also threatens the health of crops, making it difficult for plants to absorb certain nutrients. The deficiency in plant nutrients result in weak and stunted plants while plants with excess nutrients are prone to pest attacks leading to more pesticide application that cause soil pollution. Therefore, proper management of soil nutrients is necessary to grow crops faster, stronger and to produce greater yields. In 2017, under a technical cooperation project between the FAO and the Ministry of Agriculture, soil test kits and plant test kits were introduced to encourage farmers to test their soil fertility level before fertiliser application. 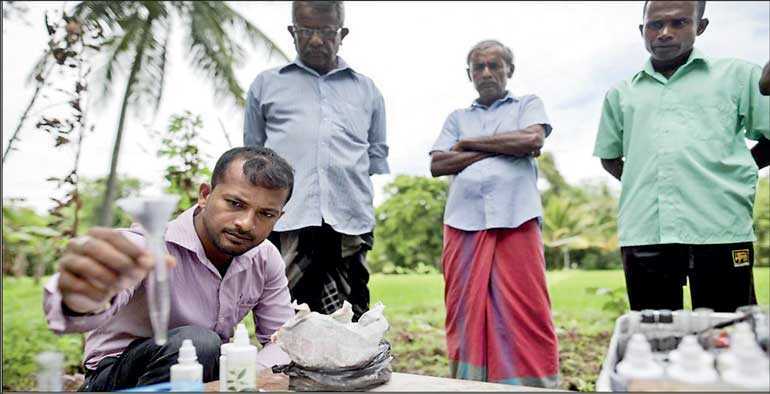 The test kits were piloted in the Kurunegala, Anuradhapura, Kilinochchi, Nuwara Eliya, Badulla, Matale, Kandy, Kalutara, Puttalam (Kalpitiya) and Hambantota districts for rice, maize, tomato, potato, cabbage, beans and bitter gourd cultivations. The soil test kits which are used to test soils in the field itself at a low cost, is a better alternative to time consuming lab testing. Farmers can use the soil test kit to determine the soil pH (level of acidity or alkalinity) suitable for food crops, and the estimation of phosphorous and potassium availability in the soil while the plant test kit is used to estimate the nitrogen and potassium availability. These are the main nutrients that strengthen the plant while the level of pH controls how well plants utilise the nutrients in the soil. To assist farmers to obtain instant results from the soil test kits and the plant test kits, a mobile application was developed. The application which can be downloaded for free by anyone is available in local languages, and is a user friendly and a low cost way to assess the results of the soil and plant tests. The test kit results can be analysed by matching the colour intensity through the mobile application. The app helps to ascertain the fertiliser requirement for an exact geographic location and crop variety. The mobile application was developed by 18 year old Janith Chathuranga Yapa, a student of the Gamini Dissanayake National School in Kotmale, in the Nuwara Eliya district. 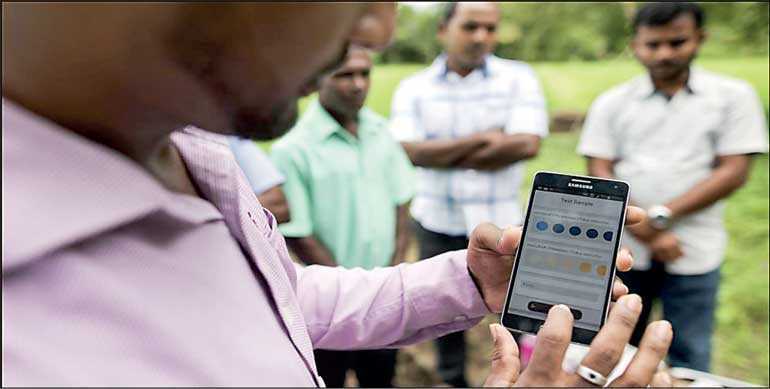 An interest in agriculture propelled Janith to begin work voluntarily on the mobile application in March this year upon a request from the Horticultural Crop Research and Development Institute (HORDI), of the Department of Agriculture. “It took three months to develop the application,” says Janith. He believes that integrating technology not just in the agricultural sector but in all sectors can yield benefits. “I am happy that the application I have developed is being used by farmers because it helps them assess how much fertiliser should be applied for their crops which can reduce soil pollution,” he points out. Land degradation due to soil erosion and decline in soil fertility is a major issue in the central highlands of Sri Lanka with 50% of agricultural lands in a degraded condition. The Ministry of Mahaweli Development and Environment, the Natural Resources Management Center (NRMC) of the Department of Agriculture, and FAO are rehabilitating these degraded agricultural lands in the Badulla, Nuwara Eliya and Kandy districts.With funding from the Global Environmental Facility (GEF), Gamini and other farmers are beginning to adopt sustainable land management practices. They were provided training and technology to construct terraces for vegetable cultivations to minimise erosion. To stabilise the terraces, farmers have started intercropping fruit crops such as pomegranate, mandarin and orange. This will increase the productivity of the land and provide an income all year around to farmers; an impetus to conserve the land for future food production.